Stewart-Amos Steel fabricates structural steel for commercial, industrial, and institutional buildings, as well as various other structures. We have fabricated projects as large as 9,100 tons and $25 million for a single contract. We generally operate within a 250-mile radius of Harrisburg, PA and are AISC certified for the fabrication of complex steel structures. We have extensive experience in providing accurate estimates for a large variety of steel structures, as well as hard bid proposals based on completed design drawings. We can provide quotes for both Union and Open-Shop projects depending on the project’s specific labor requirements. We have outstanding relationships with our erection and miscellaneous metals subcontractors (including MBEs and WBEs), which helps us ensure all our projects run as smoothly as possible from start to finish. 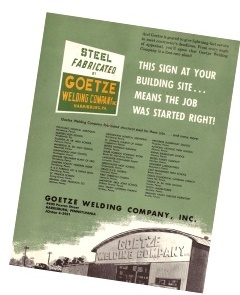 Stewart-Amos Steel, Inc. was founded in 1976 when company executives acquired the former Goetze Welding Company (established 1946). The shop at 4400 Paxton Street, Harrisburg, which already housed an experienced and skilled workforce, was quickly upgraded to be one of the most modern and efficient steel fabrication shops in Pennsylvania.